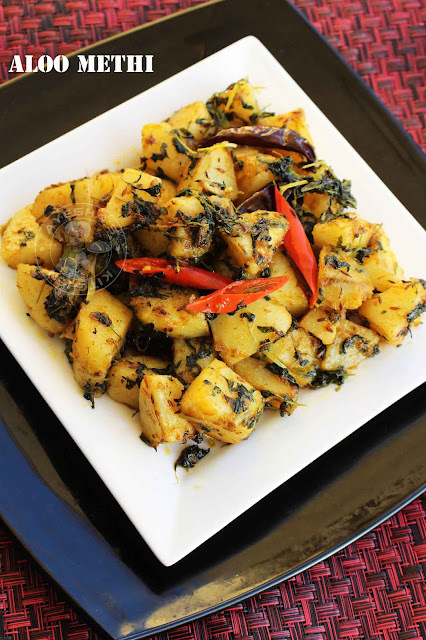 Potatoes with fenugreek leaves is a hit combination. 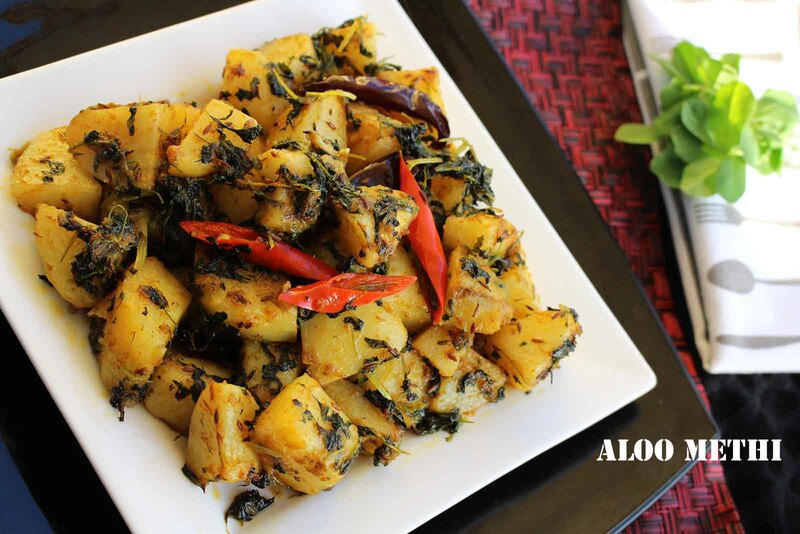 Aloo methi or potatoes with fenugreek leaves is an Indian vegetable side dish which is healthy. This potato recipe is easy, tasty and delicious side dish with minimal ingredients. This is my first recipe in my blog with methi leaves. This nutrients packed leaves taste special when added to any curry recipes or dry dishes. Moreover potato and methi leaves is a super combo as their taste complement each other. Though fenugreek leaves have a strong flavor, Indians loved this taste when cooked along with potatoes and spices. You can use dry methi (kasuri methi) instead of fresh methi leaves, but use less quantity than that of fresh methi leaves. As potato / aloo is considered as the staple of the diet in some parts of India, aloo bhindi, aloo bhaji, aloo gobi, aloo methi are some common vegetable side dishes. These vegetarian dishes of Punjabi cuisine are very popular around the world. 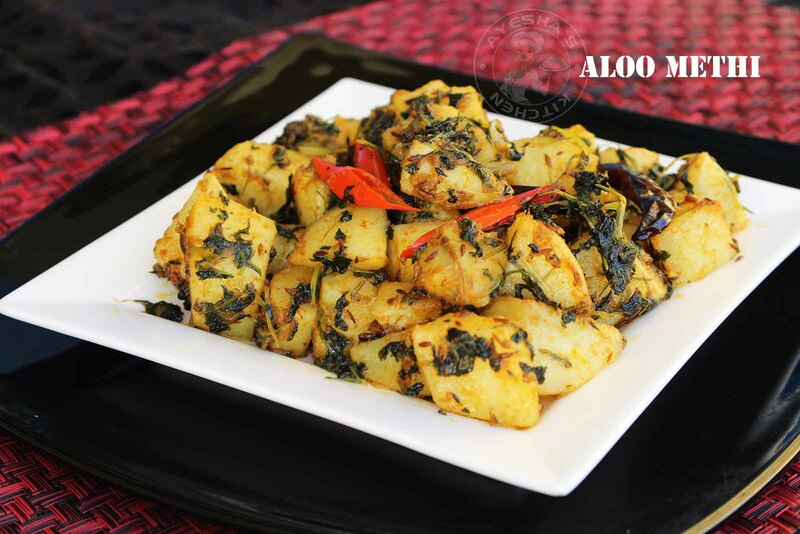 So do try this punjabi style aloo methi for your dinner along with chapati or roti. We all knew that the cuisine of punjab is well known for its diverse range of dishes. Here is the recipe showing how to make aloo methi / methi aloo / methi recipes /fenugreek leaves recipe/ punjabi dishes. Peel the potatoes and cube them into bite sized pieces. Set aside. Now pick the leaves and tender stem from a bunch of fenugreek leaves. Discard the heavy stem and then give a fine wash. Then roughly chop the leaves. Set aside. Heat oil in a saucepan and crackle cumin seeds. When done, add hing and then dried red chilies. Stir for a few seconds. Then add cubed potatoes, methi leaves (fenugreek leaves chopped), turmeric powder, coriander powder, chili powder and salt. Mix it well and cover the saucepan. Make the flame to medium. Cook until potatoes are tender and done. Stir occasionally in between. It will take around 10 - 15 minutes. You can add few teaspoons of water if it appears to be very dry. When done, add mango powder and mix well. Remove from flame. Aloo methi is ready to serve. Serve hot along with parata, chapati etc.